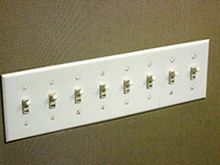 Once upon a time, a long time ago, I got tired of light switches that contained a long, one-dimensional linear array of switches mounted on a vertical wall controlling a two-dimensional placement of lights that were placed on a horizontal plane. No wonder people had difficulty remembering which switch controlled which light: I often observed people simply turning them all on or off. Why not solve the problem by arranging the light switches in what I have called a "natural mapping" between the controls and the lights. Arrange the switches in the same spatial configuration as the lights, and then mount the switches on the same spatial plane as the lights. Because switches are usually mounted on a vertical wall, whereas lights are usually located on a horizontal plane, either standing on the floor or on tables or mounted on the ceiling, the switches should be placed on a horizontal plane. 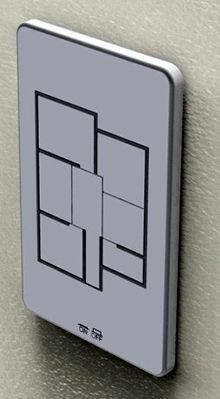 Why not arrange the switches on a floor plan of the space, so it would be easy to determine which switch worked which light? I built two such arrays of switches, one for my home and one for my research laboratory. I used a sloping plane rather than horizontal to make it easier to mount (the slope reduced the extruding surface and made the plan easier to read, but having a slope made it easier to understand the orientation). I published the story and the results in the first edition of The Design of Everyday Things (then called Psychology of Everyday Things) 25 years ago. In 1988. When I revised the book, I repeated the story and asked why nobody had ever followed up on the suggestion? I gave the story of my failed attempt to convince the CEO of a smart-home company to pay attention to the idea. Ilja Golland, a German reader of DOET, just sent me the URL for a "floor plan light switch" designed by Taewon Hwang (evidently in 2011). Hwang is identified by one website as a "Civil Engineer at Hyundai Asan, S. Korea." See the figure. Hwang seems to have been unaware of my earlier example, and he only solved half the problem: he still mounts his switches on a vertical surface. His switches seem to be only meant as a concept sketch (much as mine), and I can find no further information about either Hwang or commercial production of the switch. if some commercial company does decide to adopt it, I hope they place the switches on a horizontal plane (or at least a sloping one). They won't be able to patent the idea: my public disclosure in 1988 means there is prior art. Actually, the publicity surrounding Hwang's designs thereby makes it unpatentable (at least in the United States). I'm delighted that someone else seems to have independently thought of the idea (half the idea). In fact, not only am I disappointed that no commercial maker of electrical panels and light switches has thought of following up on this idea, but that no other people have "independently" invented it.